Alexandru Ciucurencu was a Romanian Post-Impressionist painter. He studied at the Julien Academy in Paris, having entered André Lhote's workshop. After his earlier, more colorful works, Ciucurencu opts for a more restrained palette. After 1948, his paintings align to the themes of Socialist Realism while not straying far from his typical colorist approach. In his last years, he returns to vivid colors and also paints several nearly-abstract compositions. In spite of this, Ciucurencu (as well as his fellow students) preferred to remain a figurative painter. 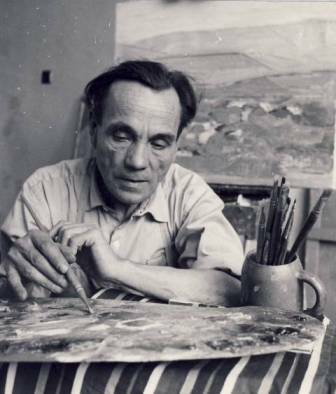 Alexandru Ciucurencu (Romanian pronunciation: [alekˈsandru t͡ʃjukuˈrenku]; 27 September 1903 – 27 December 1977) was a Romanian Post-Impressionist painter. Artworks of Alexandru Ciucurencu are removed from WikiArt due to a copyright infringement notice. Flowers and Color Tubes, ? Odalisque in Green Shalwars, ? Still Life with Vases and Onions, ? Still Life with Pears, ? Still Life with Flowers and Brushes, ? Still Life with Spring Flowers, ? Still Life with Two Pots, ? Woman with Chess Table, ?